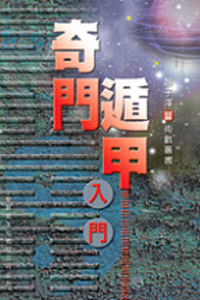 Ji Men Dun-jia 奇門遁甲 has been overly exaggerated by story tellers and even film makers in Hong Kong. Loosen hairs, funny looking costumes, fire and charms, witch dancing and all that. None of which reveals the true JMDJ. But, what is JMDJ? How does it work? Which setting was I suppose to use? And, how does it relate to the different times of the year? Other than war and battle, what else can be predicted using JMDJ? A predictive JMDJ 數理奇門 can be categorized into four different categories based upon the use of parameters of time. Be it the year 年家, the month 月家, the day 日家, or be it the 2-hours interval of the day 時家. In which JMDJ based on the time of the day is the most widely deployed method as it offers instant divine revelation. Among the four categories, there is tight connection between JMDJ and calendar, which makes JMDJ a real time application. “Ji Men Dun-jia Elementary” uses a step-by-step approaches to uncover the mystery of JMDJ. From the very basic of “Yi” and Wu-xing to complicated concept of astronomy and calendar, together with lots of illustrations, it takes you to learn this ancient Chinese Metaphysic in no time. This book covers all the four categories of JMDJ. Chapter 1 gives you a general knowledge and understanding of JMDJ by using two real life examples to highlight the use of JMDJ as an introduction. As the core of all Chinese Metaphysics, what “Yi” 《易》 is all about? Congenital Ba-gua 先天八卦 as the Substance, and Acquired Ba-gua 後天八卦 as the Application, what does it mean? What are the differences? And, why? How it is used in JMDJ? Chapter 2 provides the answers. Air, Water, Fire, and Earth are the four basic elements in Western Metaphysics, but what is Wu-xing 五行 in Chinese Metaphysics? Can we call it Elements? How do they interact? The use of the Twelve Commanders of the Month 十二月將 makes it so unique in the Three Ancient Chinese Metaphysics (JDMJ 奇門遁甲, Liu Ren 六壬, and Tai Yi 太乙), what are they? And, why are they so unique? Starting from the introduction of Chinese calendar, Chapter 4 introduces the method of setting based on time of the day in a step-by-step approach. Also covers the use of two different types of Intercalations in JMDJ, a very specialized skill in handling the “odd” days of the year. Chapter 5 renounces the mysterious and superstitious terminology used in JMDJ and unveils their scientific aspects by using Wu-xing and its implications. Chapter 6 highlights the use of JMDJ in different categories. Be it marriage, lawsuit, sports games, etc., therefore making it applicable to real life situation. This Covers the mechanisms behind each of the settings in the four categories. Reveals and corrects its connection with Chinese calendar like nobody did before. This book is written for beginner who wishes to learn Ji Men Dun-jia.